The Soviet–Afghan War lasted ower nine years frae December 1979 tae Februar 1989. ↑ 1.00 1.01 1.02 1.03 1.04 1.05 1.06 1.07 1.08 1.09 1.10 Goodson, P. L. Afghanistan's Endless War: State Failure, Regional Politics, and the Rise of ... pp. 147, 165. ↑ 2.0 2.1 2.2 "Afghanistan War – 2001–2014". 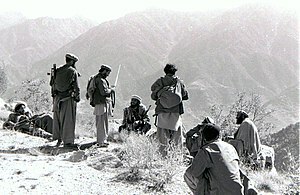 ↑ 3.0 3.1 3.2 "Afghan War – 1978–1992". ↑ 4.0 4.1 "Interview with Dr. Zbigniew Brzezinski-(13/6/97)". Archived frae the oreeginal on 2000-08-29. Retrieved October 2, 2014. ↑ 5.0 5.1 5.2 Cornwell, Rupert (February 13, 2010). "Charlie Wilson: Congressman whose support for the mujahideen helped force the Soviet Union out of Afghanistan". The Independent. London. Retrieved October 2, 2014. ↑ Barlett, Donald L.; Steele, James B. (May 13, 2003). "The Oily Americans". Time. Retrieved 2008-07-08. ↑ ""Reagan Doctrine, 1985," United States State Department". State.gov. Archived frae the oreeginal on 2007-05-10. Retrieved 2011-02-20. ↑ "Saudi Arabia and the Future of Afghanistan". Council on Foreign Relations. Retrieved October 2, 2014. ↑ Shichor. pp157–158. Retrieved October 2, 2014. ↑ Renz, Michael (October 6, 2012). "Operation Sommerregen" (in German) (40). Die Welt. Die Welt. Retrieved 6 June 2015. ↑ Nyrop, Richard F.; Donald M. Seekins (January 1986). Afghanistan: A Country Study (PDF). Washington, DC: United States Government Printing Office. pp. XVIII–XXV. Archived frae the oreeginal (PDF) on November 3, 2001. ↑ Maxime Rischard. "Al Qa'ida's American Connection". Global-Politics.co.uk. Archived frae the oreeginal on 2011-11-21. Retrieved July 28, 2011. ↑ "Soviet or the USA the strongest" (in Norse). Translate.google.no. Retrieved July 28, 2011. ↑ "Russian soldier missing in Afghanistan for 33 years is FOUND living as nomadic sheikh in remote Afghan province". Dailymail. March 5, 2013. Retrieved 21 September 2015. ↑ David C. Isby (1986-06-15). Russia's War in Afghanistan. Books.google.es. ISBN 978-0-85045-691-2. Retrieved February 15, 2012. ↑ Antonio Giustozzi (2000). War, politics and society in Afghanistan, 1978–1992. Hurst. ISBN 1-85065-396-8. A tentative estimate for total mujahideen losses in 1980-02 may be in the 150–180,000 range, with maybe half of them killed. ↑ "Soviet Air-to-Air Victories of the Cold War". Retrieved October 2, 2014.